Audi is on a tear, with striking new models generating record sales. 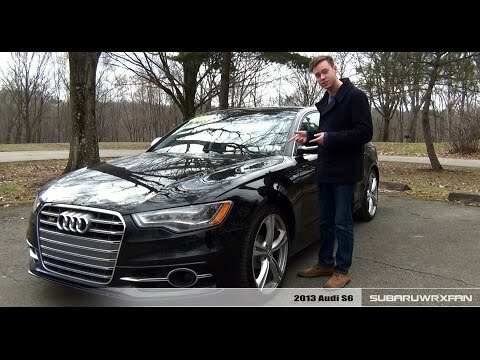 The 2013 Audi A6 sedan, redesigned last year, exemplifies Audi's strategy of going after BMW and Mercedes-Benz by confidently offering its own unique balance: technology and design, performance and efficiency. Its interior is as good as modern automotive cabins get. Volkswagen Group of America, Inc. (Volkswagen) is recalling certain model year 2013-2014 Audi S6 and S7 vehicles equipped with 4.0L engines. Due to manufacturing tolerance issues, a fuel line may leak fuel. Volkswagen will notify owners, and dealers will replace the fuel line, free of charge. The safety recall is planned to begin in late October 2013. Owners may contact Audi of America at 1-800-822-2834. Volkswagen's number for this campaign is 20U6/L8. Volkswagen Group of America, Inc. (Volkswagen) is recalling certain 2013-2018 Audi S6 and S7, 2012-2018 A7 and A6 Sedan, and 2014-2018 RS7 vehicles equipped with basic seats (with or without heating). Stress or wear of the body-sensing mat within the front passenger seat may cause the Passenger Occupant Detection System (PODS) control module to malfunction. If the PODS module malfunctions, the front passenger air bag may not deploy properly in the event of a crash, increasing the risk of injury. Volkswagen will notify owners, and dealers will install a PODS system repair kit, free of charge. The recall is expected to begin July 31, 2018. Owners may contact Audi customer service at 1-800-253-2834. Volkswagen's number for this recall is 74D5.